Domestic Apologist: UPDATED. The Bishop and the pro-life brouhaha. UPDATED. The Bishop and the pro-life brouhaha. As a former seminarian for the diocese, Sean maintains firm ties with both his former brother seminarians--many who have gone on to be ordained--and the many older priests that enriched his experience. And so with great sadness, we have been informed by priests that at the all-priest diocesan meeting last week, His Excellency Blase Cupich announced that no Spokane priests will be allowed to peacefully pray in front of Planned Parenthood. In addition, priests are not allowed to promote or organize peaceful protests outside of Planned Parenthood through their parishes (40 Days for Life was specifically named as a no-no). And the kicker? No pro-life material may be distributed in parishes unless it is published directly by the USCCB or the Washington State Conference of Catholic Bishops. Bishop Cupich stated his aversion to any of his priests, "who represent" him, being associated with the group of "extreme" pro-lifers that demonstrate with large, graphic photos of aborted babies. And with that, I end the aspect of this blog post that contains just the facts, ma'am, and progress with my train of thought after "Seriously?" Bishop Cupich is no stranger to defending life. As bishop of the Diocese of Rapid City, S. Dak., he penned many articles defending an unconditional right to life. And especially during election the 2008 election season, he promoted a South Dakota bill which would have significantly restricted abortions. And for heaven's sake, he's even featured on Priests for Life. And on top of that, 40 Days for Life is supported--and featured in writing--by the USCCB. They're not exactly a "fringe" operation in Catholic circles. 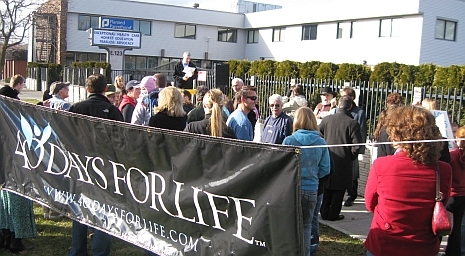 And bishop after bishop across the country support, endorse, and participate in 40 Days for Life, year after year. Bishop Aquila, anyone? For this alone, I find his recent decisions confusing and inconsistent. Next, I'm no stranger to journalism and sources. I understand that what I heard came from "someone familar with the matter" and not from a published, public document. Should the bishop recant what he said, change his mind, and issue a public statement to the contrary, well, that will be a different matter. But at the moment, this is the information we have. That leads me, then, to obedience. At his ordination, every diocesan priest vows obedience to the bishop and his successors. I, as a lay person, also must show obedience to our bishop. But he hasn't instructed me, or any other lay person in the diocese (that I know of) that I cannot or should not be praying in front of Planned Parenthood--praise God for that. Lastly, beyond the incongruity of his decisions, the issue of hearsay, and the bond all priests have to their vows, this whole account makes me feel left in the cold by the bishop, my local shepard. I have never stood outside of Planned Parenthood holding a picture of a dismembered fetus. I have never accosted or verbally assaulted anyone entering or exiting the building. I have never threatened violence against anyone associated with the abortion industry. However, I have been verbally attacted while praying peacefullly outside of Planned Parenthood with my infant son. I have been threatned physically by enraged customers of the abortion clinic. And to hear that my bishop, whether privately or publically, has instructed his priests to unconditionally avoid the very place where children are slaughered, one by one, week by week, is appalling. With all respect due to the bishop and his office (and it is quite a lot) I sincerly say: You need not endorse 40 Days for Life. You need not join me nor your fellow brother priests out there on the sidewalk. You need not even agree with this specific tactic of engaging the culture, witnessing to the public, and, as happens not-too-infrequently, saving a life (or a few hundred). But to effectively shut down the pastoral apparatus behind this peaceful campain in this diocese is insulting to the many Catholics who pour their heart and energy into pro-life work. UPDATE: We've heard a clarification today that the bishop is asking that all pro-life political material be restricted from distribution in parishes. However, material from 40 Days for Life, a non-political organization, is still included in the restriction. That is so very strange. I'll be praying for the Diocese of Spokane! As a layperson, you are not vowed to obedience. The bishop may not trample on your rights as a layperson. He cannot order you to refrain from a good work. You would not sin by disregarding that order, since such order would have no canonical basis anyway. Bishop Cupich's office releases a statement. Stanek's "bullets of interest" on Fr. Pavone. Action, accusations, and being apathetic.